Lex Luthor returns to Earth from Apokolips, after Superman has died. He encounters Perry White and the Justice League, before leaving to use his Mother Box to fight crime. He successfully stops the crime, but also terrifies the victim in the process. He takes the cape of Superman, and vows to become a better man, one that his comatose sister could be proud of, one that will one day be known as Superman. 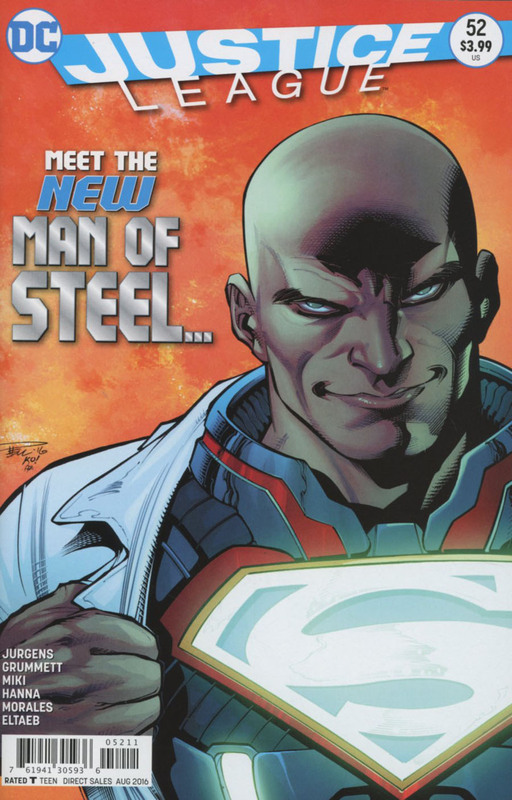 Story - 3: The fascination with Lex Luthor as a hero is perplexing. He's such an excellent villain, perhaps the only one who can justify an emotional reaction from Superman, and one who is almost Iagoesque in his hatred of Superman. Luthor's hatred of Superman stems from his existence. Full stop. There's no other true reason. However, the thought that Luthor would be a better man if Superman had never appeared should be immediately countered with the fact that he has never been that man. In every age, Luthor is a villain, only it's the common man who bore the brunt of his villainy. Superman is merely a focus for it. Superman cannot be bribed, fired, coerced, threatened, or manipulated in the matter of a layman. Superman requires all of Luthor's faculties, just to attempt to beat him... and that never happens. Een here, Luthor does not want to be a better Luthor, but replace Superman with his own image. I've heard from time to time from other readers how much they would love to see Luthor complete the hero's journey and be the better man they believe his I. Issue like this foment that notion. I rather see Luthor be what he is most excellent at being: an unrepentant foe who could care less about heroism or self-sacrifice, who is so obsessed with himself, that they mere thought of Superman's existence riles him because Superman is an idea he could never imagine, and so, logically, he must be done away with. Art - 3: Grumett has a strong, almost voluptuous line, but it still can't stand under the traded inking chores it is submitted to here. Cover Art - 3: If only I had purchased the error cover; I'd be $50 richer.